You may customize your private tour. Inquire. Toulon private tour of Aix and Cassis includes: Our private tour of Aix and Cassis from Toulon includes private transportation and English speaking tour guide, taxes, tolls and parking. This Aix and Cassis private tour begins with a guided tour in the charming city of Aix en Provence. Founded by the Romans in 103 B.C., the city was invaded and damaged by the Barbarians, yet still managed to stay prosperous. At the end of the 12th century, Aix became the capital of Provence. You will enjoy a guided walking tour of the vibrant city of Aix, appreciating the sumptuous architecture from the 17th and 18th centuries, as well as Aix en Provence’s markets and cafés, mansions and fountains, and lively streets and lovely stores. Aix en Provence was also the birthplace of the painter Cézanne; your tour guide will take you in his footsteps to see Mt. Sainte-Victoire, one of his favorite subjects, as well as his studio. To round out your tour of Aix-en-Provence, you may visit a confectionery for a tasting of candied fruits and nougats (optional; small additional tasting fee). 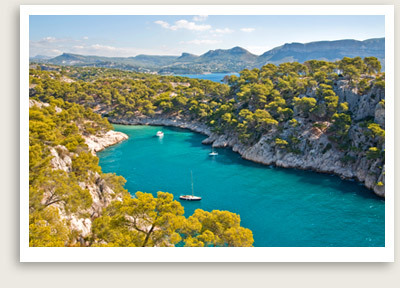 After a lunch break of your choosing, your tour guide will take you to Cassis, your final destination. This little fishing village inspired such artists like Dufy, Signac and Derain, and continues to inspire visitors today. You can relax sitting at a café near the port, watching the fishermen and street artists. Here you can also take a boat ride to admire the beautiful Calanques, little fjords with high limestone cliffs. You may round out your guided day trip in Provence to Aix and Cassis with a tasting of Navettes, a traditional Provençal sugar cookie flavored with orange blossom (optional; small additional tasting fee). Delicieux!